On the 9th (Mon), get outside with Golden Circle Route. To see photos, where to stay, reviews, and tourist information, read Blaskogabyggd trip planner . New York City, USA to Blaskogabyggd is an approximately 13.5-hour combination of flight and bus. You can also do a combination of train, flight, and bus. You'll lose 5 hours traveling from New York City to Blaskogabyggd due to the time zone difference. Plan for little chillier temperatures traveling from New York City in April, with highs in Blaskogabyggd at 43°F and lows at 33°F. Cap off your sightseeing on the 9th (Mon) early enough to go by car to Vik. Kick off your visit on the 10th (Tue): kick back and relax at Black Sand Beach, explore the striking landscape at Myrdalsjokull Glacier, then take in the dramatic natural features at Sólheimajökulll, and finally take an in-depth tour of Skogasafn. 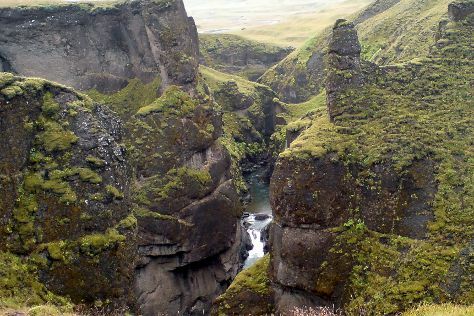 For traveler tips, ratings, photos, and tourist information, go to the Vik online attractions planner . You can drive from Blaskogabyggd to Vik in 2.5 hours. Another option is to do a combination of taxi and bus. In April, plan for daily highs up to 42°F, and evening lows to 37°F. Wrap up your sightseeing on the 11th (Wed) to allow time to drive to Kirkjubaejarklaustur. Kick off your visit on the 11th (Wed): admire the sheer force of Systrafoss, get impressive views of Skaftarstofa, and then take in breathtaking views at Fjadrargljufur Canyon. To find photos, more things to do, and tourist information, read Kirkjubaejarklaustur road trip planner . Traveling by car from Vik to Kirkjubaejarklaustur takes 1.5 hours. Alternatively, you can take a bus. Finish your sightseeing early on the 11th (Wed) to allow enough time to travel to Hof. Kick off your visit on the 12th (Thu): contemplate the waterfront views at Fjallsarlon Glacier Lagoon, then explore the striking landscape at Svinafell Glacier, and then admire the sheer force of Svartifoss Waterfall. To find traveler tips, reviews, photos, and other tourist information, go to the Hof trip planner. You can drive from Kirkjubaejarklaustur to Hof in 1.5 hours. In April in Hof, expect temperatures between 43°F during the day and 35°F at night. Wrap up your sightseeing by early afternoon on the 12th (Thu) to allow enough time to travel to Reykjahlid. Start off your visit on the 13th (Fri): take your sightseeing to a higher altitude at Mt. Namafjall (Namaskard), identify plant and animal life at Krafla Lava Fields, and then admire the sheer force of Hverfjall. Get ready for a full day of sightseeing on the 14th (Sat): explore the striking landscape at Mud Pots and then take in the natural beauty of Hverarond. For reviews and other tourist information, you can read our Reykjahlid day trip tool . Drive from Hof to Reykjahlid in 7 hours. Traveling from Hof in April, plan for a bit cooler nights in Reykjahlid, with lows around 29°F. On the 14th (Sat), wrap the sightseeing up by early afternoon so you can travel to Reykjavik. On the 15th (Sun), pause for some serene contemplation at Hallgrimskirkja, get engrossed in the history at National Museum of Iceland, and then discover the deep blue sea with a scuba or snorkeling tour. Get ready for a full day of sightseeing on the 16th (Mon): get a dose of the wild on a nature and wildlife tour, then appreciate the history behind The Statue of Leif Eiriksson, then enjoy breathtaking views from Perlan, and finally explore the galleries of Reykjavik Open Air Museum. For traveler tips, ratings, maps, and other tourist information, you can read our Reykjavik online attractions planner . You can do a combination of bus and flight from Reykjahlid to Reykjavik in 4 hours. Other options are to do a combination of bus and flight; or drive. In April, plan for daily highs up to 43°F, and evening lows to 33°F. Finish your sightseeing early on the 16th (Mon) to allow enough time to travel back home.